Our friend Dave Dilegge at the Small Wars Journal is soon to publish a number of perspectives on the new media. Yours truly contributed a paragraph to this piece, so jump on over there to see if Dave has published this article yet. If not, then jump over there tomorrow too. In fact, make the SWJ a daily stop. Since Dave will include our little paragraph it won’t be rehearsed here. But as a perspective to occupy your attention over the weekend, here is a sober and yet snarky take on Milblogging from the perspective of The Captain’s Journal. How is it possible to ascertain the difference TCJ makes, if any? Very difficult. TCJ thinks that the affect of the new media is very much a mixed bag, with the professional military still learning to deal with the openness and unstructured nature of it all. TCJ knows with certainty at times that our efforts are not having the intended affect. TCJ called out the Taliban strategy to target logistical lines one year before it began to occur and continued to harp on this issue repeatedly. When nothing of strategic or tactical value comes from such efforts, we have failed, and failed badly. Later, using analysis tools TCJ noticed this article being studied at great length by a reader at the Counterinsurgency Center at Leavenworth. The Captain went to bed happy that night. Two counterinsurgency practitioners had discussed the issue of terrain in COIN without ever talking directly to each other. They did so because the Captain wrote an article on the subject. Mission accomplished. Another such example occurred just today, with someone from Army.com network domain from Fort Benning who Googled the phrase “need for Army linguists in COIN,” with TCJ category Language in COIN coming up first on the first page (where The Enemy of My Enemy is linked). Hopefully, someone somewhere will be persuaded to spend a few more dollars on teaching language to young warriors. TCJ is mostly analysis and advocacy. There is certainly a symbiotic relationship with the main stream media, but we believe that we are as valuable an analysis asset as anyone in the main stream media. On occasion, we scoop exclusive interviews and other information, such as with intelligence sources in Ramadi that scooped us the word on the smuggling lines of Abdul Sattar Abu Risha being targeted and shut down with kinetic operations as a precursor to the “flipping” of the tribes in Anbar. Our sources are as good or better than any in the main stream media. It has been said that blogging is an exercise in vanity. Perhaps, and perhaps not. Maybe this is true only to a limited extent. TCJ could get 100,000 visits per day (an impossibility good but hyperbole to make a point), but if it could be proven that we had not one iota of affect on policy, strategy, logistics or tactics, then this blog would be shut down tomorrow. Visits are irrelevant if no impact is being made. Milblogging can be hard work, regardless of what the reader may think. If one is serious about these things and strives to make a difference, then he must study, read, think, stay up late pondering things that effect life and death, and think about the sons of America that have perished along the way, and the pain experienced by their parents or spouses. If you’re trying to pick a hobby, there are much easier and more lighthearted things to do with your time. This can be heavy stuff. Now for the questions. TCJ wants to know a few things. When the donate button was up on the web site in an attempt to fund embeds for Jim Spiri and The Captain, why didn’t anyone donate a single dollar? If this is an indication of the value of this web site, then why does this site bring visitors back regularly, and why has traffic increased? With the high intelligence level of many of the readers of this web site – and there are some smart ones – why don’t we get more comments? One has to register for the web site, but that’s easy. One has to register for Michael Totten’s web site too, but he gets regular comments. At one time the reader didn’t have to register for comments, but the hate mail, profanity and even threats in the comments created a need to bring more control. Why has this resulted in much fewer comments? More questions. Why does TCJ have readers it doesn’t even know? Granted, one can register for Feedburner and read the feed without ever visiting the site. But why would a reader not drop a note and let us know they exist, and agree or disagree with our perspective? Speaking of Feedburner, can someone please explain why the numbers fluctuate so wildly? Why will it show 320 readers on Feedburner one morning, and 198 that night? What does that mean? And for that matter, how many Google Reader readers do we have? Now to the sardonic and snarky. TCJ absolutely, positively and completely refuses to compare ourselves with other blogs. We won’t do it. Period. So readers should not do it. We do what we do, others do what they do. Leave others out of it. And speaking of comparisons, what about that guy John Robb at Global Guerrillas? Check out his Feedburner readers? 11416 at this writing. Why isn’t TCJ that high? In terms of comparison, we are as good as Robb, aren’t we? Maybe we need to work harder on coming up with slick and pedantic acronyms for everything. Or maybe would should talk more about swarm theory. Then we would have 11416 readers instead of 320 – or 198 – or whatever. One of the brighter sides of blogging like this is the exchange of e-mail that occurs between bloggers and professional military. Guys like the Godfather of Milblogging, Matthew Currier Burden, knows who I am and is happy to talk with me. TCJ has enjoyed the witty quips back and forth between Andrew Exum who blogs at Abu Muqawama. It has been a pure pleasure to get to know Dave Dilegge at the Small Wars Journal. TCJ absolutely cherishes the long, thoughtful, scholarly and very personal notes back and forth with Col. Gian Gentile, Academy Professor and Military History Division Chief at West Point. TCJ also appreciates all of the trust various professional military have placed in us, giving us first hand accounts, personal perspectives, good analysis and sometimes OPSEC (which of course TCJ doesn’t divulge). This is always good for creating the right perspective, even if the information is too sensitive to share. And TCJ is smart enough to know when something is too sensitive to share. There are also more journalists and bloggers such as Andrew Lubin and Steve Schippert, who we consider very good friends, who have been kind, and who have played an important role in the evolution of TCJ. Mostly, TCJ is thankful to God for the safe return of our very own warrior from Iraq in 2007, and soon-to-be safe return from the 26th MEU in 2009. This blog existed as an outlet on sleepless nights waiting for that fateful knock at the door by a Marine Chaplain that didn’t happen. If there is a single bit of worth to this blog it will be continued. But this is so very difficult to measure. What metric would one apply, and how would data be gathered to assess that metric? There are still many questions, and this article hasn’t yielded any answers. Reader Brett Turner kindly sent the following story our direction. Regular readers of The Captain’s Journal know that we have harped on the weight of body armor – and in particular, ESAPI plates – in just about every article (on body armor) we have written. We have strongly recommended government money be spent on designing new and improved ESAPI plates that don’t weigh as much as the current generation of plates. The total weight of the MTV comes to around 32 pounds. We have recommended that experts be engaged, from materials engineering to fracture mechanics practitioners. Now comes a University of Virginia student who has led the effort we recommended, except that there is no government money involved – yet. The most stalwart medieval knight probably griped about the crippling weight of his shining armor. The metal’s inflexibility left plenty to complain about as well. And there was its nasty tendency of allowing sharp edges and pointy-tipped projectiles through cracks and creases. The nation’s combat forces continue to deal with these same shortcomings, despite tremendous advancements in modern body armor. U.S. Army Sgt. Jeff O’Dell saw vivid examples of body armor saving American lives during his deployment in Iraq. The University of Virginia second-year student also knows how Enhanced Small Arms Protective Inserts can restrict movement and fail to stop multiple bullets. The four bulky ceramic plates now in use in protective vests used by American forces are also heavy, bringing the weight of a vest to nearly 30 pounds. “I was deployed in Iraq as a fire support specialist from August 2005 to December 2006,” said O’Dell, who is serving in the National Guard while attending UVa. “Our armor vest had single ceramic plates in the front, back and on each side. “The vest has saved the lives of some of my buddies, but having worn it a lot I know it can be improved upon. It’s too heavy, it doesn’t stop multiple rounds and it doesn’t flex. Last September O’Dell seized upon an opportunity to possibly help save countless lives in the future — maybe even his own. As a double major in biomedical engineering and mechanical engineering, he took a Design Discovery class that introduces second-year students to conceptual and practical design work. The class educates students on how to come up with novel products and ultimately market them. The class is broken into small teams of students who work together on projects they originate. O’Dell teamed up with Ann Bailey, Adam Rogers and Dan Abebayehu. When the student-soldier proposed the idea of creating a better armor vest the others quickly signed on. “I had family members in the military so this hit close to home for me,” said Bailey, who is from Elkton. “And I like the idea of working with something that will actually be beneficial to someone. “This project has been a real opportunity to work on something that will actually make a difference. I also like the fact that we’re at a school with so many resources and where the professors are so willing to help. The armor vest project quickly became more than an exercise in how to get a passing grade. Inspired by O’Dell, who will likely be deployed to Afghanistan later this year, the team began working feverously on a new design that would eliminate the historic shortcomings of body armor. A few months ago examples of the students’ new vest were put to the test at H.P. White Lab in Maryland. In the company’s ballistics testing facility, round after armor-piercing round were fired into the vests. The team’s radically new design proved so successful and groundbreaking that a second round of testing will take place on Thursday. This time Army representatives will be present to evaluate the students’ system firsthand. “The Army is interested because we’ve come up with a design that offers flexibility and more capability for stopping multiple armor-piercing rounds,” said O’Dell, who was born and raised in Martinsville. “A lot of it has to do with our design, and a lot of it is the material we’re changing. “When the results came out so well during the first round of testing we made contact with a possible commercialization partner, which is an armor company in Pennsylvania. They got in touch with the Army and set up the testing for later this month. The new vest presents a classic example of what can result from a well thought-out course that emphasizes creativity and cooperation. O’Dell lauded the fact that the class was structured to give students step-by-step guidance during each stage of the project. The students were made aware of available resources and professors who were experts in areas that could be helpful. One expert was Haydn N. Wadley, Edgar Starke Professor of Materials Science and Engineering. He gave the four students a crash course in body armor materials and how they work. William F. Walker continues to guide and mentor the engineering students. He said his main goal in the class was to motivate students to go out and find their own problems to work on. “I want the students to find something they’re passionate about, and will throw themselves into fully,” said Walker, associate professor of biomedical engineering and electrical and computer engineering at UVa. “Some students will accept the challenge like this team has done, and will go like mad. “What Jeff and his team members have done is really not in my area of expertise, but the data they’ve gotten in testing so far really speaks for itself. Experts I’ve spoken to who do know this field haven’t seen anything like this before. When the defense contractors have nothing else to gain because they already have a fat contract and thus no incentive to design something better, a young warrior-student steps into the gap. What a story. God bless this effort, and God bless these students. This information is proprietary, so they will be unwilling to go into too much detail concerning the materials and design specifications. But we will contact them to see just what we might learn about the effort. We will be tracking this very closely. I like Ralph Peters. Always have. I enjoy reading his analyses even when I disagree. Ralph is a good writer, great stylistically, and certainly knowledgeable on a great many things. That’s why I have concluded that Ralph has been smoking pot, or hash. I’m certain of it. Certain. Not any pot, mind you, but some bad, bad weed. Something’s wrong with the stuff he has been doing. That’s the only explanation for his most recent analysis of the options in Afghanistan. Just a little of it is reproduced below. • Best. Instead of increasing the U.S. military “footprint,” reduce our forces and those of NATO by two-thirds, maintaining a “mother ship” at Bagram Air Base and a few satellite bases from which special operations troops, aircraft and drones, and lean conventional forces would strike terrorists and support Afghan factions with whom we share common enemies. All resupply for our military could be done by air, if necessary. Stop pretending Afghanistan’s a real state. Freeze development efforts. Ignore the opium. Kill the fanatics. • Good. Leave entirely. Strike terrorist targets from over the horizon and launch punitive raids when necessary. Instead of facing another Vietnam ourselves, let Afghanistan become a Vietnam for Iran and Pakistan. Rebuild our military at home, renewing our strategic capabilities. • Poor. Continue to muddle through as is, accepting that achieving any meaningful change in Afghanistan is a generational commitment. Surge troops for specific missions, but not permanently. • Worst. Augment our forces endlessly and increase aid in the absence of a strategy. Lie to ourselves that good things might just happen. Let U.S. troops and Afghans continue to die for empty rhetoric, while Pakistan decays into a vast terrorist refuge. Dude. Quick. Somebody grab his bong while he isn’t looking. Actually, this notion of smashing our enemies and leaving has a very robust and time-honored tradition. I have discussed it extensively with one particular Marine to whom I am very close (wink), and even the enlisted men know that there are various foreign policy paradigms. This idea also matches quite nicely with the imperial nature of the U.S. Marine Corps, fighting our battles on foreign soil rather than our own, and the expeditionary nature and structure of the Corps. As long as we recognize that we would be back into Afghanistan – and we most certainly would – then leaving now is a viable option. It’s the first (so-called “best”) option that causes The Captain’s Journal to believe that Ralphie has been taking a few tokes on some wicked reefer. The first option is not viable. If we withdraw to a couple of bases, it would be similar to withdrawing completely. The Afghan police would be slaughtered within two to three weeks. The Afghan National Army would last longer, maybe six weeks. The Taliban would be inside Kabul in force within a few weeks, and the Karzai regime wouldn’t last longer than the six weeks that the Army existed. The Taliban would take over again. Any interpreters, transporters or moderates would be summarily executed by the Taliban. There would be no logistical supply into any of the bases, and so all supply would be done by air to the larger base and helicopter by smaller base. The helicopters would be routinely shot down by rocket fire. The Taliban would completely control the terrian outside of all bases, and no intelligence would be forthcoming to kill the bad actors. No intelligence would be forthcoming because there would be no one left alive who would talk to the U.S. about the whereabouts of the bad actors. There would be no interpreters left alive, and so no communication with the Afghan population at all. It would be like the Tower of Babel. The police would all be dead, and the Army wouldn’t exist any more. The main base would always be under attack my mortar, RPG, rocket and small arms fire, and no missions outside of the base would occur via ground transport because of the IEDs. It would all have to occur via helicopter, and Taliban would be permanently garrisoned outside of the base to shoot down any helicopter that ventured out of the base. The base would be relegated to force protection alone, and staying alive would be the goal of the miserable deployment for the Soldiers and Marines. As for the smaller bases, they would take so many casualties that assignment to them would be seen as a death sentence. Casualties wouldn’t even be able to be flown back to the main base (and certainly not Germany or Aircraft Carriers) for treatment. Staying alive would be the main occupation of men on the main base. It would be almost impossible on the smaller FOBs or outposts. In short, the first option won’t work. It’s not that it isn’t desirable. We have tried it for six years in Afghanistan, and it’s why we are where we are at the moment. So withdraw completely – bring them all home – get rested up and retrained – and then prepare to go back and do it again later. So be it. The next Afghanistan campaign in three or four years after another 9/11. That’s a viable strategy. It will work. Or, go big and present force projection in order to kill the enemy, secure the population, and build a system that prevents the existence of threats to America. But the small footprint option is a loser. It won’t work, and by the time we figure that out, too many sons of America will have died in such a stupid plan. And someone please grab Ralph’s bong. He needs to get clear-headed. He is a contributor to this thing. We need him sober. Having made a forecast and allowing the dust to settle on the scene in Swat, The Captain’s Journal is turning back full circle to see how all of this is shaking out for Afghanistan. It is understood the North West Frontier Province government has agreed an amnesty for Taliban fighters, including those who have bombed girls’ schools and video shops and beheaded opponents. It also follows a shake-up in the Taliban alliance led by Baitullah Mehsud. He has announced a new umbrella group, the Shura Ittehadul Mujahideen, which includes two senior militant commanders who had until now been regarded as ‘pro-Pakistan government’ Taliban. According to one militant source in Bajaur, Baitullah Mehsud had recently received a message from the Taliban’s ‘supreme leader’, Mullah Omar, calling on him to stop attacks on the Pakistan Army and reminding him that Nato forces in Afghanistan were their real enemy. Implementation of Sharia law is only part of the deal. The Pakistani Army will leave. The institutions set up by the Taliban are now formalized and official, recognized by the Pakistani government. Given the proximity of Swat to Afghanistan, safe haven for the Taliban doesn’t even begin to explain the depths of the problem. The problem goes not only to territory and terrain, but preoccupation of the Tehrik-i-Taliban (TTP). Although not exclusively, the TTP has primarily been disposed with fights inside of the North West Frontier Province and Federally Administered Tribal Areas. They are now no longer occupied with fights with the Pakistani Army. These fighters are now free to engage U.S. troops, and thus has Pakistan traded off its “security” for that of Afghanistan. And the campaign in Afghanistan has just gotten a little harder. So if this report is accurate, we find out the impetus for the combination of the Tehrik-i-Taliban with other Taliban commanders as well as the “settlement” with Pakistan. Mullah Omar rebuked the TTP for attention on Pakistan, and reminded them that infidels were just across the border. This is new information, but as for the forecast concerning the new attention on Afghanistan, you heard it here first. Eventually the goal is to turn over the security of the Afghan population to the Afghan National Army and Afghan Police. This lofty goal is a long way off, according to the intitutional problems known to exist within the Afghan police. Drug addiction is the first hurdle. Sixty per cent of the Afghan police in the country’s southern province of Helmand use drugs, it is claimed. The estimate, made by a UK official working in the province, was contained in emails obtained by the BBC. International forces are fighting a fierce counter-insurgency campaign against Taleban militants and other insurgents in Helmand. But British officials are clearly worried about the reliability of the Afghan police. “We are very concerned by the levels of drug abuse among the police,” the British Foreign Office said in a statement. On patrol with the 3rd Brigade Combat Team of the 10th Mountain Division we get the raw reaction to the Afghan police and their lack of honor and integrity. This report is profoundly troubling, especially given the previous reports of drug problems in the Afghan National Army. There is much work to do within the government and institutions themselves in order even to begin to turn over security to Afghanistan. Pakistan’s Tehrik-i-Taliban, led by Baitullah Mehsud, have released an important statement. NORTH WAZIRISTAN – Bringing an end to their internal rifts, Tehreek-i-Taliban Pakistan (TTP) leaders have renamed their group as Shura Ittehadul Mujahideen with the purpose of striving for the supremacy of Islam and crushing infidels. The three leading militant groups calling themselves as Taliban have circulated a single-page Urdu pamphlet in different parts of Waziristan, which confirmed that they had got united according to the wishes of Mujahideen leaders like Mullah Muhammad Omar and Sheikh Osama bin Laden. The three leaders Hafiz Gul Bahadar, Baitullah Mehsud and Maulvi Nazir have confirmed the establishment of Shura Ittehadul Mujahideen with certain objectives. The pamphlet said the target of the Shura Ittehadul Mujahideen was to get Mujahideen united at a single platform for Jihad and stop those who were violating and crossing the limits. It said that TTP had decided to shun differences and join hands with one another. It added the TTP supported Mullah Muhammad Omar and Osama bin Laden’s struggle against Obama, Zardari and Karzai administrations. A number of Quranic verses have been referred in the pamphlet, stressing upon Muslims to get united and join hands against non-believers. Another account gives us reason to pause concerning the evolution of this organization. The announcement described Mulla Omar and Osama bin Laden as their leader. They vowed to continue the Jihad for the enforcement of Sharia in the region. It further said that it was yet unclear whether Tehrik Taliban has been finished. Besides, Taliban leaders belonging to Bajaur, Swat and Mohmand Agency were not invited. It’s difficult to know – and maybe premature to speculate – about why other commanders weren’t invited. The most probable reason is that the Tehrik-i-Talban included everyone in the meeting who mattered to the highest leadership. Baitullah Mehsud and his closest commanders were there, and Baitullah is completely in charge of the TTP. His enemies, far and near, should beware. Inclusion of others would have been pointless. More important to this pronouncement is that there now seems to be a formal recognition of the globalist intentions of the Tehrik-i-Taliban, and a statement that the infighting between factions would come to an end, or at least, so says the highest leaders. We have noted this globalist aspect of the TTP before. In some places they aim to enforce strict sharia law. In others, the Taliban want to establish bases from which to work in support of the resistance against foreign forces in Afghanistan. In yet other areas, the purpose is simply to create chaos and anarchy so that militants can engage the Pakistani armed forces and deter them from supporting the global “war on terror”. However, the ultimate mission of the groups is steadily harmonizing, that is, to support the regional war and then the global war against Western hegemony; this is the concept driving the neo-Taliban. The Captain’s Journal will be watching this development. More time is needed fully to understand the implications of the pronouncement by the TTP. Iran is quickly advancing towards becoming a nuclear state. In troubling developments in air power, Iran can now deploy UAVs, and Russia may have supplied Iran with new air defense systems, including their long range S-300 surface to air missiles. If they haven’t, the system is being used as a bargaining chip by Russia. There are reports that they have refused to sell the missile system, but responding to the Israeli plan to sell weapons systems to Georgia by saying that Moscow expected Israel “to show the same responsibility.” In the first case, Iran is armed with an air defense system that would make an attack against its nuclear assets much more difficult. In the second case, Russia has used this potentiality to weaken Georgia and prime it for another invasion. While snow covers the Caucasian mountain passes until May, a renewed war with Georgia is impossible. There is hope in Moscow that the Georgian opposition may still overthrow Mikheil Saakashvili’s regime or that the Obama administration will somehow remove him. 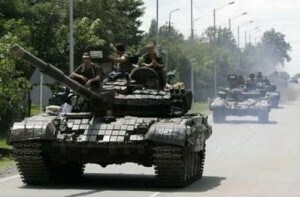 However, if by May, Saakashvili remains in power, a military push by Russia to oust him may be seriously contemplated. The constant ceasefire violations could escalate to involve Russian servicemen – constituting a public casus belli. The desire by the West to “reset” relations with Moscow, putting the Georgia issue aside, may be interpreted as a tacit recognition of Russia’s right to use military force. With the addition of the Biden pronouncement that the U.S. would “press the reset button” with Russia, the U.S. is now in the throes of a logistical dilemma. On the one hand, the missile defense program for NATO states is meant as a deterrent for a potential Iranian nuclear and missile based military capability. On the other hand, the current administration is seen as likely to jettison the whole project. 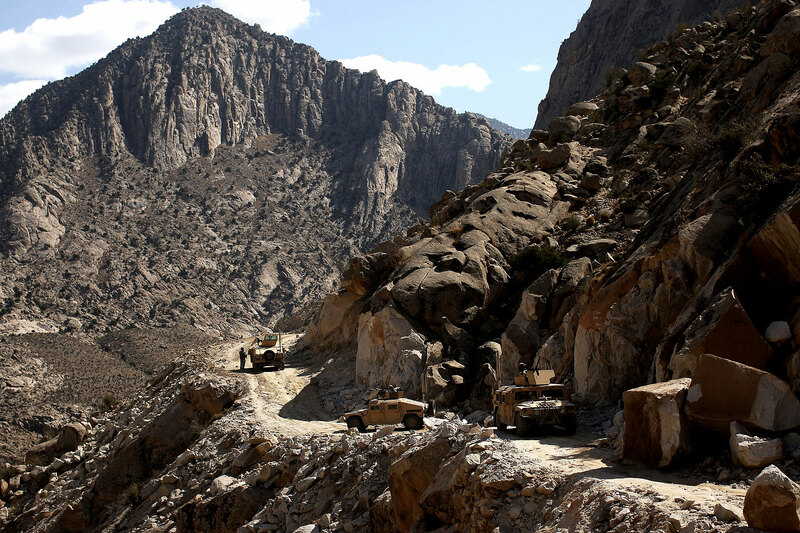 The U.S. is now beholden to Russia for logistical supply lines to Afghanistan. General David Petraeus has visited numerous European and Central Asian countries recently, including Kyrgyzstan and Uzbekistan. Supplies are soon to leave Latvia bound for Afghanistan. But the common element in all of the logistical supply lines are that they rely on Russian good will. This good will exists as long as the missile defense doesn’t, and the missile defense was intended to be used as a deterrent for Iranian nuclear ambitions. Alternative supply routes have been suggested, including one which wouldn’t empower Russian hegemony in the region, from the Mediterranean through the Bosporus strait, into the Black sea, and through Georgia to neighboring Azerbaijan. From there the supplies would transit across the Caspian Sea to Turkmenistan, and from there South to Afghanistan. An alternative to the air route from the recently closed Manas Air base is sea transport to India, rail or truck to the Indian-controlled Kashmir region, and then air transport to Kabul. But none of these options has been pursued. The current administration is locked into negotiations that empower Russia. Pakistan President Zardari has observed, and correctly so, that Pakistan is in a state of denial concerning the threat posed by the Taliban, yet rather than eliminate the threat, the strategy has been to make peace deals with the Tehrik-i-Taliban and plead for the same financial bailout being offered across America, saying that in order to defeat the Taliban Pakistan needs a “massive program,” a “Marshall Plan” to defeat the Taliban through economic development. Certainly, some of the foreign policy problems were present with the previous administration, from the failure to plan for logistics for Afghanistan, to support for Musharraf’s duplicitous administration, assisting the Taliban by demure on the one hand while money was received with the other. But the currents appear to be pointing towards a revised world opinion of what the U.S. is willing to sustain on behalf of “good relations,” and the current administration’s prevarications appear to be going headlong into numerous dilemmas. We wish to use the missile program in Europe as an bargaining chip to avoid the reality of an Iranian nuclear program, while the Iranian supreme has said that “relations with the U.S. have for the time being no benefit to the Iranian nation.” Russia, who is assisting Iran in its military buildup, is unimpressed because we have planned for no other option for logistics for Afghanistan except as dictated by Vladimir Putin. The best that we can come up with, so far, is to forestall the planned troop reduction in the European theater, a troop reduction that is needed to help fund and staff the war against the global insurgency. Pakistan’s Zardari figures that if the administration is willing to give away on the order of a trillion dollars, they can play the game of “show me the money” like everyone else, from Russia over logistical lines to Afghanistan to over-leveraged homeowners in the U.S.
Israel figures that all of this points to throwing their concerns under the bus, and thus they have launched a covert war against Iran, a program that is unlikely to be successful, pointing to broader regional instability in the near term. Hassan Nasrallah, leader of Hezbollah, has said that they will acquire or have acquired anti-aircraft weapons. While they have stood down over the war in Gaza, they are apparently preparing for more of the same against Israel. The current administration has attempted to befriend Syria, while at the same time the USS San Antonio has interdicted Iranian weapons bound by ship to Syria, intended for Hezbollah or Hamas. Most of this has occurred within less than two months of inauguration of the current administration in Washington. It may prove to be a difficult four years, with unintended consequences ruling the day. Update: Welcome to Instapundit readers and thanks to Glenn for the link. How many Taliban will settle? Counterinsurgency luminary David Kilcullen was interviewed by Reuters, and made an interesting forecast regarding settling with the Taliban. Q – Should U.S.-led forces negotiate with the Taliban? A – The answer to that question depends on who you think the Taliban are. I’ve had tribal leaders and Afghan government officials at the province and district level tell me that 90 percent of the people we call Taliban are actually tribal fighters or Pashtun nationalists or people pursuing their own agendas. Less than 10 percent are ideologically aligned with the Quetta shura (a Taliban leadership council) or al Qaeda. The others are almost certainly reconcilable under some circumstances. What I’d say with regard to that would be that its very important to negotiate from a position of strength, not a position of weakness. We want to make the population feel safe. We want to secure the environment and then negotiate to bring the people in. That’s very much what we did in Iraq. We negotiated with 90 percent of the people we were fighting and and then brought them into the inclusive security structure. Kilcullen is of course correct about the need to be in a position of strength as well as the strategy of settling with Sunni insurgents in Anbar. Referral to our category Concerned Citizens (the original name for the Sons of Iraq) shows that we strongly supported this strategy. However, the difference is that while al Qaeda and al Qaeda-aligned fighters fought mainly for religion reasons, the indigenous Sunni insurgency had no religious motivation whatsoever. But according to one Taliban leader in Kandahar, they don’t report to the Haqqani fighters. “We are all fighting for Islam,” said the leader. This religious motivation – even if perfunctory – is dissimilar to the indigenous Sunni fighters in Anbar. The sense of things now is that Iraq and Afghanistan are too different to apply this one lesson from Iraq. Kilcullen cites “tribal leaders” for his statistic (he might simply be citing rather than endorsing the statistic), but of course people can say anything for just about any reason. For that matter, so could the Taliban leader in Kandahar who said they all fight for Islam. That’s the point. This campaign is probably not far enough along to know if 90% of the Taliban will side with a government which sides with the U.S.
U.S. Army soldiers with the 1-6 Field Artillery division patrol an area where there has been reported Taliban presence February 18, 2009 in Gandalabog, Afghanistan. (Photo by Spencer Platt/Getty Images). The Obama administration is advancing a strategy of assurances of regime stability (versus regime change) and security guarantees as an incentive for jettisoning its steady but deliberate advances towards becoming a nuclear state. Such an approach is founded upon the axiom that the Iranian Mullahs are seeking security and stability rather than regional or world hegemony. But this is contrary to their stated views. “We do not worship Iran. We worship Allah. For patriotism is another name for paganism. I say let this land [Iran] burn. I say let this land go up in smoke, provided Islam emerges triumphant in the rest of the world” (Khomeini, pg. 16, The Iranian Time Bomb). So unhindered in their pursuit of nuclear weapons by either the past or the current administrations (since they both have bought into the “grand bargain” approach to Iran), the Iranian scientists and engineers under the thumb of the Mullahs have advanced their plans for nuclear weapons to the point that even the U.N. (IAEA) is now a bit surprised at their progress. Iran has built up a stockpile of enough enriched uranium for one nuclear bomb, United Nations officials acknowledged on Thursday. In a development that comes as the Obama administration is drawing up its policy on negotiations with Tehran over its nuclear programme, UN officials said Iran had produced more nuclear material than previously thought. They said Iran had accumulated more than one tonne of low enriched uranium hexafluoride at a facility in Natanz. If such a quantity were further enriched it could produce more than 20kg of fissile material – enough for a bomb. The new figures come in a report from the International Atomic Energy Agency, the UN’s nuclear watchdog, released on Thursday. This revealed that Iran’s production of low enriched uranium had previously been underestimated. When the agency carried out an annual stocktaking of Natanz in mid-November Iran had produced 839kg of low enriched uranium hexafluoride – more than 200kg more than previously thought. Tehran produced an additional 171kg by the end of January. “It’s sure certain that if they didn’t have it [enough] when the IAEA took these measurements, they will have it in a matter of weeks,” Mr Zimmerman said. Iran’s success in reaching such a “breakout capacity” – a stage that would allow it to produce enough fissile material for a bomb in a matter of months – crosses a “red line” that for years Israel has said it would not accept. While the prose is more discriminating, the headline is completely, factually incorrect. The Financial Times article is headlined “Iran Holds Enough Uranium for Bomb.” The Telegraph headline reads about the same. It’s important to understand what this does – and doesn’t – mean. The process begins with Uranium ore, which is then milled into a concentrate called “yellowcake” (U3O8). This is then converted to Uranium Hexafluoride gas (UF6) before enrichment. Further chemical processing converts this to UO2, and this is apparently where the Iranians are in the process. “Low enriched Uranium.” This means on the order of 4-5% U-235, not the 90% or greater U-235 enrichment needed for nuclear weapons. They still have work to do. This realistic assessment doesn’t ameliorate the threat that Iran poses, but it does mean that there is still time to prevent a nuclear Iran. Iran needs to enrich the Uranium to weapons grade, and to date there is no indication that they have done so. But there is every indication that they intend to do so. The question is whether the will exists to prevent the existence of a nuclear Iran. A survey of the scene shows that Iran can now deploy UAVs (or drones), is still assisting the Taliban, and doesn’t want any part of the grand bargain. It’s important to clarify what the most recent revelations from the IAEA mean. It’s also important to clarify where the U.S. stands with respect to a nuclear Iran. While the U.S. investigates its policy, the advancement of Iran proceeds apace to become nuclear.